Tension mounted in the Apple vs. Samsung patent trial Tuesday, threatening to spill over as another major tech player entered the fray. One of Samsung's scheduled expert witnesses, Ted Williams, was barred from testifying after a lawyer from Intel revealed the Ph.D. hasn't been forthcoming about several nondisclosure agreements. Apple started things off when it said Williams didn't properly disclose he had signed multiple nondisclosure agreements, including one with Intel. Samsung hoped Williams would discuss Apple's alleged infringement of one of Samsung's cellular data transmission patents, including citing some source code. Intel's lawyer said Williams was intimately involved with several other cases, including one between the International Trade Commission and Motorola dealing with many of the same issues present in this case. The lawyer said Intel also had a problem with Williams because he hand't kept Intel in the loop about his involved in the Apple vs .Samsung trial. When Intel let Samsung know about Williams, "they told us they'd get back to us on this issue," Intel's lawyer said. The issue was dropped until Intel found out late Monday Williams was set to testify Tuesday. U.S. district Judge Lucy Koh said Williams can't testify until the three companies agree on what nondisclosure agreements need to be in place. Koh admonished both sides for bringing up the Williams issue hours before he due to testify. "I want papers," she said. "I don't trust what any lawyer tells me in this courtroom. I want to see actual papers." With so much time spent denying it copied Apple's designs, it's easy to forget Samsung filed it's own countersuit, saying the Cupertino company actually copied from its South Korean rival. Samsung witness Woodward Yang, a professor at Harvard's School of Engineering and Applied Sciences, testified to that Apple has in fact infringed on three Samsung patents. 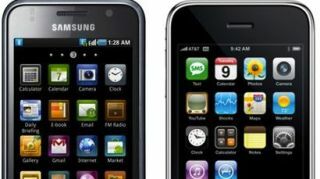 In analyzing three Samsung patents, Yang alleges Apple's iOS 4 and iOS 5 devices - the iPhone 4S, 3G and 3GS as well as the iPad 2 and fourth-generation iPod touch - all infringe the patents one way or another. The first patent protects email and photo browsing in camera equipped devices, while the second also specifically protects the ability to browse photos in a gallery, jump to a camera app to take a photo and return to a gallery where last left off. The iPhone 3G is the only iOS 4 device not to infringe on the second patent. Finally, Yang presented information on the broadest of them all, a patent that protects the ability to play music in the background on a mobile device while performing other functions. While the iPad 2 is excluded from this patent due to the specification it covers "pocked-sized mobile communication devices," the fourth-gen iPod touch's FaceTime capacity classifies it as a communication device. Taking a page from Samsung's book, Apple lawyers tried to poke holes in Yang's methodology. Speaking through a translator, witness Jeeyeun Wang, a senior designer on Samsung's wireless design team, stated her company - and its employees - never ripped off Apple. Wang said she herself picked out the green phone icon Apple accuses her company of stealing. Describing sleepless nights and time spent away from her newborn child, Wang testified that during the production of devices like the Galaxy S, she never looked at Apple's designs to create her own. "We tried to develop Samsung icons, something that represents Samsung," she told the court. Wang described the process behind selecting several icons, such as taking modifying a wallpaper image of a flower to create is Gallery icon. During her cross by Apple, Wang several times denied any association with documents showing side-by-side comparisons of the iPhone icon layout with Samsung devices, although her name appeared as the "custodian" for several of them. Samsung's lead lawywer, John Quinn, clarified Wang's name was on the documents because she had helped assemble them for the trial. Samsung's final witness of the day, Itay Sherman, the head of an Israeli tech company, contended none of Apple's design patents are invalid. Sherman's reasoning falls in step with an argument Samsung has been making all along: prior art. The problem with Apple's design patents for both smartphones and tablets, Sherman said, is that they're obvious. As a visual aid, Samsung attorney Charles Verhoeven passed around a 2002 tablet-like device, the HP TC1000. Design elements like flat screens, where the speaker's located and rounded corners are so "functional," Appl's right to patent them is minimal. To undercut Sherman's testimony, Apple attorney Rachel Drevans laid six Samsung smartphones produced after the iPhone next to an iPhone. If the design elements were so functional and obvious, why didn't Samsung apply the designs to these phones, Kraven posed. In court documents released Monday, one Samsung designer encouraged his teams to emulate the iPhone, not copy it. "[L]earn through the lessons of the iPhone," Sungsik Lee wrote in an internal email shown during the cross-examination of Apple expert Terry Musika. The memo, dated March 2, 2010, was sent to Samsung's user experience executives approximately one month before the Galaxy S, one of the devices Apple is asserting trade dress claims against, hit shelves in June. Lee wrote of Samsung's user experience having the mindset of "clinging to the past generation." "I am not saying to make what is exactly identical to the iPhone," Lee continued, "but I am saying to learn the wisdom of the iPhone, and recognize the standard of the industry which is set by them already."